Saturday morning was upon me and I had no problem rolling out of bed as the alarm went off at 4 am. My dogs were going to be locked up all week, so I wanted to get them all run before I left. I was flying out of Corpus Christi, Texas, an hour and ten minutes away. All my packing was done and I decided to run dogs until 9am then shower and change for the trip and leave at 10am, regardless. I didn't want to be running late on this trip at all. I took the dogs out in teams of six and got through all the dogs in the kennel pretty fast. Inside my large bag was my new raingear that I had been threatening to buy for two years and all the warm clothes I could muster . I packed every rubber and hiking boot imaginable so I would be ready for anything. The bag was huge and when I got to the airport they tagged it as "heavy". I actually pulled out of the ranch at seven minutes to ten. I was amazed at being early. The flights went well and I even had a long layover in Houston. My planning and preparation was paying off. Everything was going like clockwork. When I stepped off the flight, I called the cell phone number of the person picking me up - and they were sitting outside the door waiting for me. I was feeling proud of myself - not one stone had been left unturned in the preparation for this assignment . I walked over the luggage carousel and it went around and around and around until everyone had left - except me. NO BAG! I was concerned, but not overly worried at this point. Maybe because it was heavy it was somewhere else. I found a representative and they said, "No, all the bags were off and there were no more flights until 11:30am, tomorrow." I asked where my bag was and they said they had no idea. I got a little testy and they got a little testy back. I told them I wanted my bag and they said it would most probably turn up... sooner or later. I caught my lift to the national hotel with my little knapsack and no luggage. Hmmmmm how did this happen? Once I got over the idea that my luggage was lost, I figured I would just deal with it. Upon arrival at the nationals headquarters hotel at McPherson, Kansas, word had spread about my luggage. I had to explain why we were late. One of the first people I bumped into was Bill Boeckman. He quickly supplied me with a full rainsuit. Ray Palluchi came, offering his spare size 13 boots - but I passed on those as I figured I could get both feet into one boot! Don Bramwell said he wore size nine and a halves, so I relieved him of his hiking boots. Pete Rainey had a nice pair of shooting gloves that I took a liking to. In my room, the message light was flashing and it was Continental Airlines informing me that they still had no idea where my luggage was and that maybe I should check with them the next day. "In a heartbeat, Sam was back with the bird. After the long succession of "A" series, I had my first "A++" and my heart was beating from not only going up the hill but the pure excitement of a superb series." There was some kind of banquet that night. Don’t asked me which one because by that time I was too tired to take anything in. In fact, I’m not sure there was anything that night. Everyone was full of the good news that it was supposed to rain and snow for the next three days. I was a tired puppy and I retired to bed. Tomorrow was the big day! The word that springs to mind when I think of 151 dogs in a first series is daunting. I woke up feeling tired and was more than a little worried at what was ahead of me. I walked out of the hotel room and the cold wind cut into me. By the time I got to the coffee machine across the way, I was freezing. When you work in an average temperature of 80 degrees I think your body forgets how to stay warm. I started shivering uncontrollably. Somewhere along the line Steve Beyer had briefed me that the course would be an "up and stop and back". I smiled and said, "A huge loop would be better than that with 151 dogs." Steve shook his head and said, "No, every dog needed a cross wind to keep it fair." I then said, "Well, the wind always changes and it ends up being upwind downwind." Steve shook his head and said, "Well, at least we tried." I couldn't see the logic in this, but decided to give Steve a hard time. I could see he was ready to give me one back. What a great guy and how hard he worked throughout the whole trial. My first hats off goes to Steve Beyer. Enough of the cold and lost luggage. Soon enough I found myself taking my first dog. It was an into the wind crossing. I made a mental note to mention that to Steve. 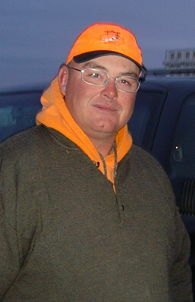 Ken Willis had two fairly simple retrieves and scored a solid "A" series . We were under way. All was proceeding pretty mundane into the wind with a succession of solid "A" series as the birds were not moving in the snow. Scenting was good to very good. I started to become concerned this was no test of a dog! Then, along came dog #25 Sam (CFC/FC Robinsmoor Frolic) with Marty Knibbs. Sam's first bird was moving and it was a pleasure to see a dog taking a moving bird. It was also amazing to see how fast Marty Knibbs can move when has to! The bird was produced and it hit the ground, wounded and moving. Sam quickly took it out and retrieved it to hand. Wow! my first good performance. The second bird was even better. Sam took it up a hill and Marty followed in hot pursuit. Just over the top of the hill, Marty stopped Sam once for us to catch up. The gun dropped the bird and it glided a ways. In a heartbeat, Sam was back with the bird. After the long succession of "A" series, I had my first "A++" and my heart was beating from not only going up the hill but the pure excitement of a superb series. When a dog has a super series and does something out of the ordinary, it will get my highest score of "A++". All proceeded semi smoothly until #43 Sam (Skaar’s Sorcerer) hit the line under the expert guidance of no other than John " Spike " Wright. I had noticed my co-judge, Clay Earl, send on a couple of hellacious retrieves. The gallery judges had already decided that we had got together before hand and decided to send on everything. For once the gallery judges were wrong - we had not. "Another "pip" from Jim and we caught up a second time. I remember thinking this is how it should be done." Sam flushed a bird and it flew outwards down the course towards the top of a hill. I heard four gun reports and saw the bird flinch three times. It finally ran out of steam and dropped to the ground. After seeing thousands upon thousands of birds shot, I quickly came to the decision that this bird needed to be sent for. Besides, it was a long retrieve but still not as long as some that Clay had already sent on. I tapped John and Sam rocketed up the hill. He was out of sight in the cover but when reached the top of the hill a bird rocketed out of the cover. I didn't even think it was the same bird, the bird that went down was hit three times it would not rocket out like that. John could not see Sam (I think) but he released him and we waited. I really wanted Sam to come back with that bird it was the first "humdinger" as I called them, that I had sent on. Sam re-appeared a few times and it became evident that he might not find it. After some conversation about the severity of the task at hand, John asked me what I would like to do. I replied that I would like that bird. A few more minutes and John picked him up. Later on, I heard that gallery judges had decided that the bird that flew up was John’s bird and he had unjustly been thrown out of the Nationals. In subsequent events, I excused two dogs from retrieves after I decided I had made a mistake, but in this instance, I think not. You put 151 dogs in a National and give us easy courses to run . Just what is there to distinguish the good dogs? 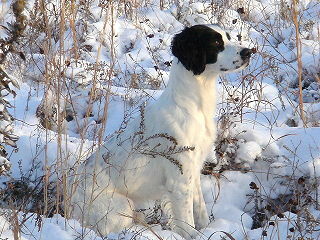 Some advocates of not sending on long retrieves say "it’s not fair" and ‘it’s an unfair advantage on other dogs." So, a bird that moves off the plant and is tracked out is also an unfair advantage and the list goes on. As Jason Givens says, "life is not fair get over it." After a few "A+"s and a lot of "A"s, along came Rob. Rob had an extremely fast and well executed series leaving me wondering if I should have seen another bird just to see this dog some more! I decided to leave it alone. Another four series to go. At the end of the day, we had looked at 121 dogs. Who could believe that you could look at that number of dogs in a day? We retreated back to the hotel for warmth and nourishment. The next morning we finished off the first. I was wondering just how we were going to judges these dogs on easy courses with good scenting? However there were four more series to go and the night was young, so to speak. After watching all these dogs for five days, there are a number of incidences that stuck in my mind. There were a lot of really good handlers out there, but if you want to see how a field trial dog should be handled, there are two handlers you should watch: Jeff Miller and Paul McGagh. Both of these guys know what’s needed to win a National. When I think of both of these handlers, what springs to mind is "minimal". Minimal handling. Minimal whistle. They just have finely trained and tuned animals and they let them do their thing. It was an absolute pleasure to watch these guys run their dogs. Most probably, their record speaks for itself. I think they have seven National Championships between them. There was a lot of running after dogs on into the wind runners. Then along came Jim Keller with one of his dogs. Donnie Brunn decided to stop his dog on a runner, but it wasn't clean. I certainly didn't hurt him for it and scored him a little higher than the running handlers. Jim’s dog went off on a runner towards a tree line. At just the right time, Jim gave a short "toot" and hupped the dog. He proceeded at a correct but brisk pace and sent the dog on. The dog picked up the trail again and off we went. Another "pip" from Jim and we caught up a second time. I remember thinking this is how it should be done. 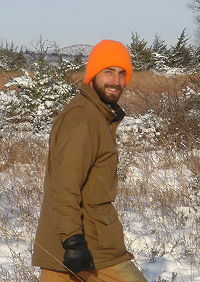 When we reached the tree line, I saw the bird double back and run across some bare ground. It was fifty yards away in a heart beat. 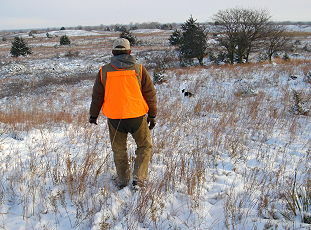 Because of the thickness of the tree line, we lost track of the dog and the bird. At the appropriate time, Jim whistled the dog back in. It was a wonderful piece of work and I gave him full marks for it. I personally think that’s how all runners should be handled. My next honorable mention was before the fifth series. We were waiting for the course to be planted and all the handlers were about as uptight as could be. I fully understood their emotions and feelings. After months and months of training and thousands of miles of traveling, here they were at the end of their work. I happened to look behind me at the hillside and their was Billy Akouris sitting there playing with his dog. They were having the best time. She was rolling on her back and he was pushing her away and she, pushing back. It was a wonderful sight - the two of them there enjoying themselves. The last honorable mention goes to Ed, the winner. Ed had got stronger and stronger as the trial went on. One of the things that Clay and I like about him was that he wouldn't go around cover. If it was in his way, he went through it. The fifth series was not really what we wanted for the fifth series of a National. It was a fairly short course with very light cover. 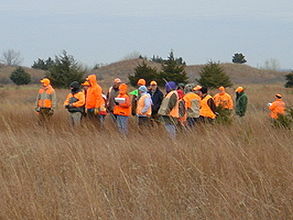 There was one patch of thick cover that nearly all the dogs skirted. None of them went through it. That is, until Ed - he came screaming across the course. I can see it now - and he hit that cover full force. The thickness of the cover knocked him sideways, but he drove on and through it. It took my breath away. I remember saying to myself, "That's not everything, but it certainly don’t hurt." These are my honorable mentions from five days of watching some great performances. 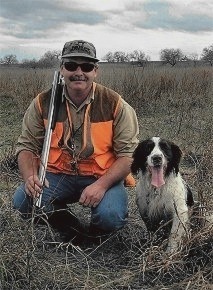 David J. Jones is a professional gun dog trainer, hunt guide and owner of the Strong Gundogs kennel at Tivolli, Texas. 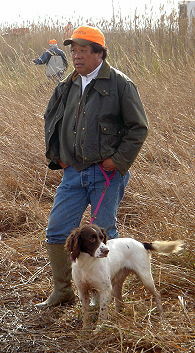 He has been involved with training, hunting and breeding English springer spaniels for most of his life. His first employment in the field was at the prestigious Saighton Kennels at Anglessey, Wales. 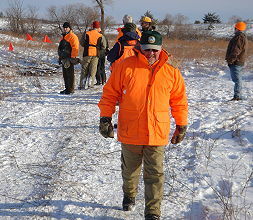 David has judged numerous field trials - springer and cocker - as well as the 2004 National Open Championship. He is also the founder of the National English Springer Spaniel Shooting Dog Championship which he has hosted for the past five years.